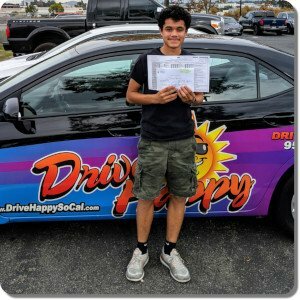 Home / Behind-the-Wheel / What Is Going To Happen On My First Driving Lesson? 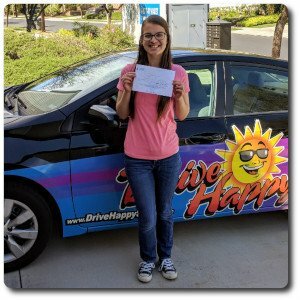 What Is Going To Happen On My First Driving Lesson? The first time you get in the car with your instructor, you will be in the passenger seat. We never start a student driver out in their own neighborhood. Why? Because having your family and friends snapping pictures, and peeking out from windows as you get behind-the-wheel will make you nervous. Your instructor will drive you a short distance to a quiet residential street. Our training car is very customizable, to allow students of all heights to control the car comfortably. Your instructor will help you to adjust the seat, steering wheel, mirrors, and seat belts. 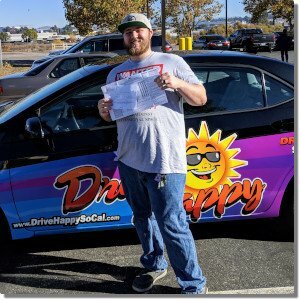 If you have never driven a car before, don’t worry! Your instructor will also identify the basic control for you. The next exercise will introduce traffic and main roads. You will be leaving the quiet area and practicing right and left turns at major intersections controlled by lights. You will also learn how to locate and obey posted speed limits higher than 25mph. With more cars on the road, you will also how to measure and maintain a safe following distance, sharing the road with bicyclists and pedestrians, making protected and un-protected left turns, and how to make a right turn on a red light. Advanced students may also basic lane changes. As you approach the last 30 minutes of your first driving lesson, you instructor will begin directing you towards your home. You will get to drive in your own neighborhood. We may also cover the skill of curb parking, and backing in a straight line. Very few new skills are introduced in the last 30 minutes because you have already absorbed an enormous amount of information and are starting to fatigue. At the end of the lesson, you will learn how to park in your driveway. If no one is home, we will schedule a phone call or e-mail update. Your instructor will probably give you a homework assignment. Don’t worry, it will be something fun (ie. go out and drive often, practice those right turns, watch the videos on our website, etc.) We will also try to schedule your next driving lesson. We are very flexible, however we suggest lessons to be no more than 2 weeks apart. If you are not able to practice in-between lesson we suggest that your lessons be as close together as possible. Repetition is the way to build good habits, drive often and you will drive safe. This is what you can expect from your first driving lesson. Please remember that every student is an individual and there are slight variations from lesson to lesson depending on a multitude of factors. If you have any questions or comments, share them in the comment section below.